Halloween time is that magical prelude to the holidays where you can really start getting in the spirit of the season. However, with all those fuzzy fall feelings also comes a pretty evil menace to society and your waistline: Halloween and fall-themed treats. They can be found in the bowls on front desks of businesses all over town, in the hands of every female coffee addict (lookin’ at you PSLs) and they stare you down from nearly every corner of the grocery store. I tend to regard Halloween time as the “warm-up” to full-blown holiday food debauchery. It’s a handful of candy corn here, a Reese’s pumpkin there, and before you know it it’s Christmas and your kids don’t have any cookies to give to Santa because you inhaled them all in one sitting. Don’t worry, I’m not judging, I don’t even have kids and I’ve been there. If you want to shut down this year’s holiday treat-gorging cycle, start by avoiding these fall treats we’re all compelled to flock to, and I guarantee you’ll be set up for strong decision making once Peppermint Mocha’s and Starbucks red cups start hitting the streets, which, you know, should be any week now. I’m convinced there are two types of people in the world, those that absolutely love candy corn and those that hate it. If you’re in the hate category consider yourself lucky. If you love it, just know I’m suffering right along with you. It takes serious willpower not to keep a bag within arm’s reach all day while you’re working, so the best strategy here is to just not buy them at all. Candy corn is one of the worst Halloween treats out there because it has zero redeeming qualities. 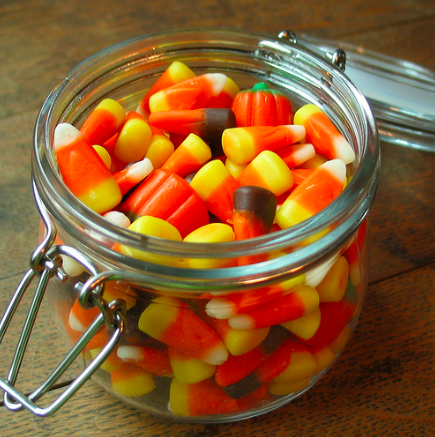 Candy corn is just sugar, honey and artificial coloring. That’s it. There are no healthy fats or proteins, and there are about 150 calories per ounce. Forget about zombies and ghosts, I think that calorie count is scarier. 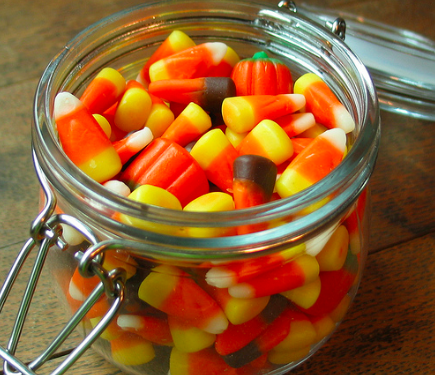 Since candy corn is something most people don’t eat year round, keep yourself limited to a few pieces here and there during October and don’t buy yourself a big bag. Basically I’m telling you to mooch a few pieces off other people. That’s simply the only way to avoid overindulging. Oh, the PSL. This eagerly anticipated seasonal drink can really pack on the pounds if you overindulge. First of all, the ingredients are very vague (read this article from Food Babe for the full breakdown), but there are three things that are certain: there is a TON of sugar (49 grams, which is more than a Coke), zero pumpkin and a slew of artificial flavorings and colors. Besides the obvious health pitfalls, these drinks are expensive. A tall comes in at about $3.75. Between how many calories and grams of sugar you’re banking, and the amount of money you’re shelling out, this treat simply isn’t worth it. Again, it’s not something you drink year-round, so maybe give yourself an allowance of two a month for October and November, but no more than that or else it’s not really a treat anymore. If you’re someone who can’t fathom going without your daily pumpkin-y spiced beverage, try Tazo Pumpkin Spice Chai tea (I know you probably want to slap me right now for comparing tea to a PSL, but bear with me). This tea has that great spicy and pumpkin flavor, plus the incredible smell we’re all addicted to, and with a splash of almond milk, it’s seriously good. You also get 20 tea bags for $3.99, and it’s caffeinated. The seasonal Reese’s (which also includes the tree-shaped cups at Christmas time) are larger and can contain an extra 100 calories and double the saturated fat. To give perspective, a standard Reese’s cup is 88 calories a piece, and one pumpkin is 180. Also, the individually wrapped mini cups are 44 calories, so you’re talking a big difference. The reason we have an issue with candy like Reese’s cups and candy corn is because they’re so bite-size and easy to have one after another. After the first taste or two, it’s not even the candy we want, it’s just the gratification of continual snacking. If you’re really craving a Reese’s pumpkin, offer to split it with a coworker or your parter. Savor your one bite and move on. Alright, I had to throw one thing in there that’s at least a little bit good for you. Carmel apples tap in to my childhood memories, so I don’t even try to deny myself because it’s not worth it, it’s a treat I love that I only have once a year. So don’t mind me, I’m just living my life, reminiscing and slathering my face with caramel like a toddler. However, there’s one trick to being able to enjoy this treat without suffering a sugary pitfall, just make them yourself. A 2.5-ounce serving of caramel (caramel apples at a store or fall fair typically contain 2 to 3 servings) contains 271 calories and 5.75 grams of fat, but if you make them yourself you can significantly cut down on the sugar. Rather than dunking your entire apple, just add a generous drizzle of caramel and maybe add some chopped nuts for added protein and fiber. At least you’re getting some nutritional benefits with your apple, just don’t follow that “apple a day keeps the doctor away” saying when it comes to the caramel variety. Should You Abandon the Self-Breast Exam?